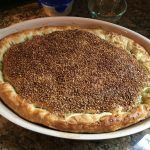 Another Bookclub Saturday; The Angel: The Egyptian Spy Who Saved Israel with a side of Meat Pie! Another Bookclub Saturday, the book that was chosen was supposed be to be an “action” theme – so we selected The Angel: The Egyptian Spy Who Saved Israel. I can’t say its the best read. But the historical information was interesting. The constant list of “who’s who” got tiring after the first chapter, yet the discussion bid yield some interesting insight on the book. That aside – it provided a great day for a food theme. 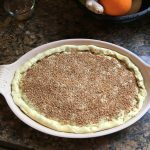 I opted to bring an Isreali Meat Pie recipe I found on the NYT Cooking site. Which is in itself an adaption. For my version, I omitted the dill (a few folks around here don’t like it) and added more cinnamon but thats to taste I think. This version was super simple and can be prepped the night before or over the course of an afternoon. Depending on your time. 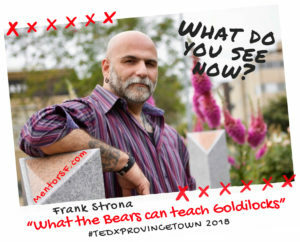 My edits to this variation are in red. 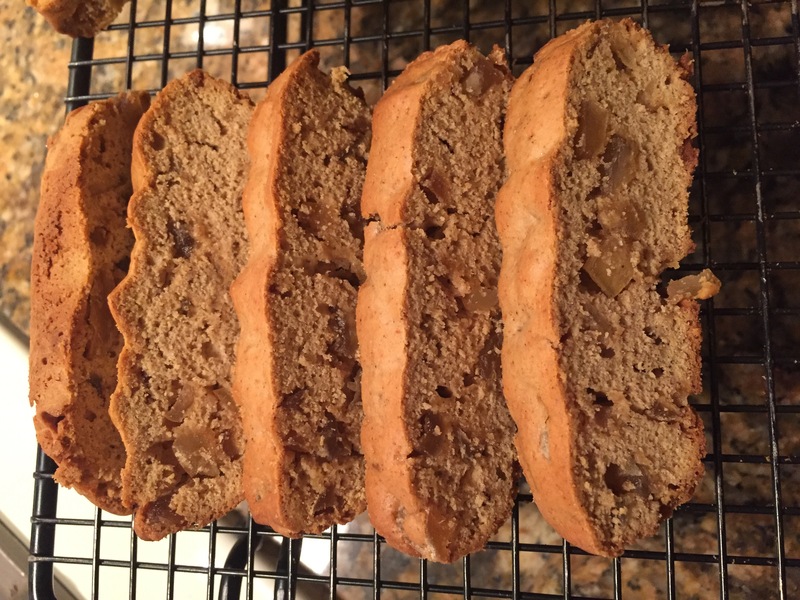 Now having made and eaten it – it was a win – great taste, simple and clean flavor. I definitely could serve as a base for adapting; by adding ginger, garlic, cheese etc. It traveled well – but seems to taste best while still warm and crisp. According to NYT’s Melissa Clark ; this was featured in: In ‘Zahav,’ Michael Solomonov Explores Israeli Food. Posted in Recipe? What Recipe?. 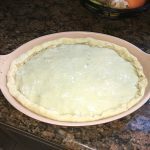 Tagged meat pie, Recipe. 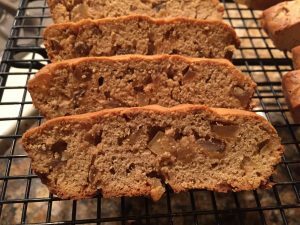 I wrote about on “the battle rages on” which is actually yet its own adapted recipe from Valerie Bertinelli’s Helen’s Black Pepper Biscotti . Th e original recipe uses walnuts, which isn’t on of my favorite nuts – so often omit it. Posted in Recipe Book. Tagged Biscotti, Recipe. Every so often I want a hearty meal reminiscent of all the traditional flavors of thanksgiving — but a) don’t want to make all the parts or b) its the middle of the summer. So what to do? Figure out how to get all the flavors in a simpler delivery process. 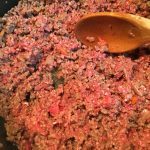 After thinking on this for a few days – I came up with this simple recipe for a “Harvest” chili. Its easy to swap out flavors that suit your tastes was well. This is a “working” recipe. Which means it is in progress-so open to hearing suggestions from folks as well. 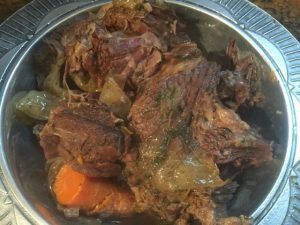 I’m working on a slow cooker varation as well. In a large heavy-bottomed saucepan or dutch oven, add oil and butter. Turn on and heat the oil/butter over medium-high heat. Add chopped celery stir until soft. Stir in fennel seeds, stir well to allow the fennel seeds to get warm and mix with vegetables. Add poultry seasoning, salt, dried parsley, and red pepper flakes. Cook until its well incorporated and hot (2- 5 minutes). Drain the oil and return the turkey and sausage to the pot. Hint: Add some additonal fennel seeds to the meat while its cooking. Add chicken stock, kidney beans, chopped sweet potatoes, mix to incorporate – you may need to add more water so it just covers the mixture by an inch. Bring it up to a simmer, scraping up the brown bits that cling to the bottom & sides of the pan with a wooden spoon. Simmer for 35 minutes and while you still have some moisture add the greens and corn. Cook another 10 – 15 minutes until the chili has thickens. Note – At this point it’s a personal preference how loose or thick you want the chili – you can add more broth or water – or to add a another layer – pour in a good quality low sodium turkey gravy . Alternatives to the recipe included adding Worchester sauce (about 2 tspn) when adding the stock and it gave a nice undertone – worked well with the all turkey version. You can go for a more traditional touch, chopped Granny Smith apples or peeled chestnuts, raisins or currents and heating them in it just long enough to get them warm – but still pop when you bite them. You can also add cooked rice or fresh tortellini or mini raviolis (cooked) if you want to make it more hardy. To serve, place in a bowl, top with croutons and a spoonfull of cranberry sauce or chutney or smoked nuts. Note: Alternatively, you can toss in some dried “bread cubes” or cubed italian style bread crumbs to give you that “stuffing” feel earlier when you add the tomatoes as well. .
Hmm; it was my birthday yet somehow last night I ended up baking last week. Tried making the Ginger Biscotti again but this time using old metal ice trays as the form instead of the free-form style on the pan because of the sticky loose batter. While at it I used an old “Martha” trick of using clips to hold the parchment paper and place. All in all these vintage worked great and gave me a more uniform size an bake. Preheat the oven to 350°F. Lightly grease (or line with parchment) one large (about 18 x 13-inch) baking sheet. For the variation I did – one batch filled two ice trays. In a medium-sized bowl, beat the butter, sugar, salt, spices, vanilla, and baking powder until the mixture is smooth and creamy. Beat in the eggs; the batter may look slightly curdled. 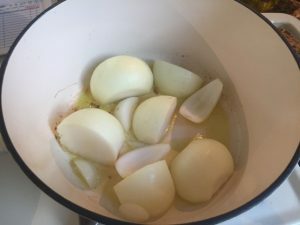 At low speed of your mixer, add the flour and crystallIized ginger, stirring until smooth; the dough will be quite soft and sticky, but should hold its shape when you drop it from a spoon. Transfer the dough to the prepared baking sheet, and shape it into a rough log about 14″ long. It will be about 2 ½” wide, and about ¾” thick. Using your wet fingers, smooth the top and sides of the log. Bake the dough for 25 minutes (my oven 20 min was perfect – the extra 5 gave me a more brown bottom). Remove it from the oven, and allow it to cool on the pan anywhere from 15 to 25 minutes; just work it into the schedule of whatever else you’re doing in the kitchen. Reduce the oven temperature to 325°F. Wait another 5 minutes, then use a serrated knife to cut the log into ½” to ¾” slices. Cut at a 45° angle, for long biscotti; cut crosswise slices, for shorter biscotti. 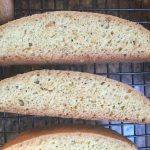 As you’re slicing, be sure to cut straight up and down, perpendicular to the pan; if you cut unevenly, biscotti may be thicker at the top than the bottom, and they’ll topple over during their second bake. Set the biscotti on edge on the prepared baking sheet. 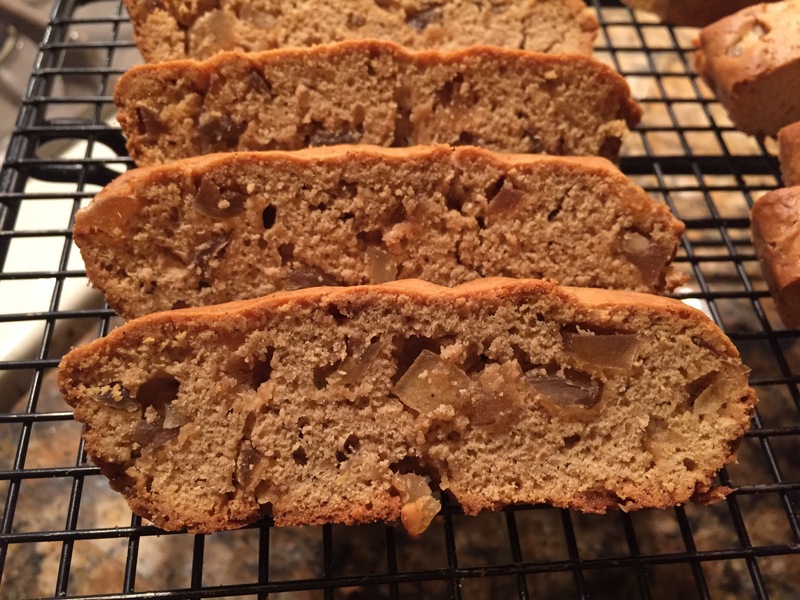 Return the biscotti to the oven, and bake them for 25 to 30 minutes, till they feel very dry. They’ll still feel a tiny bit moist in the very center, if you break off a piece; but they’ll continue to dry out as they cool. 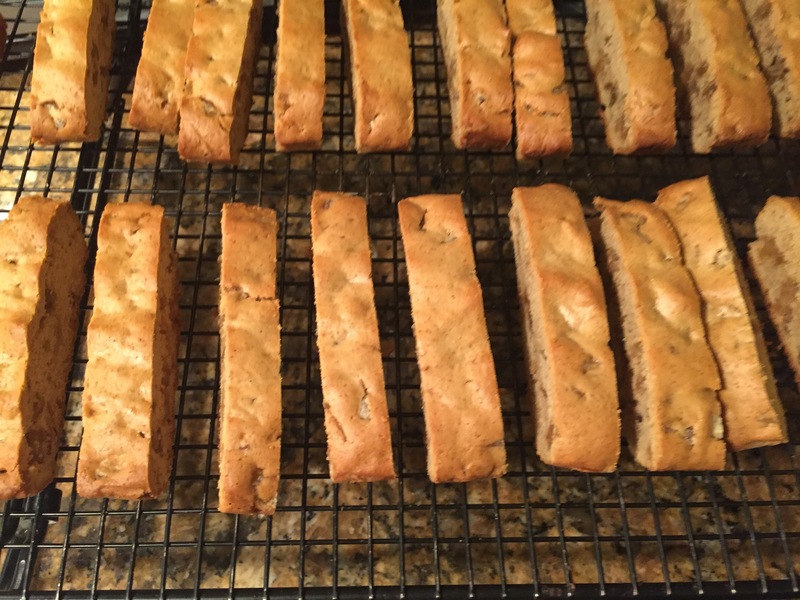 Remove the biscotti from the oven, and transfer them to a rack to cool. Once they’re cool, store airtight, to preserve their texture. 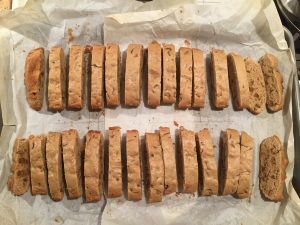 If biscotti aren’t as crunchy as you’d like (and the weather is dry), store them uncovered, overnight, to continue drying. 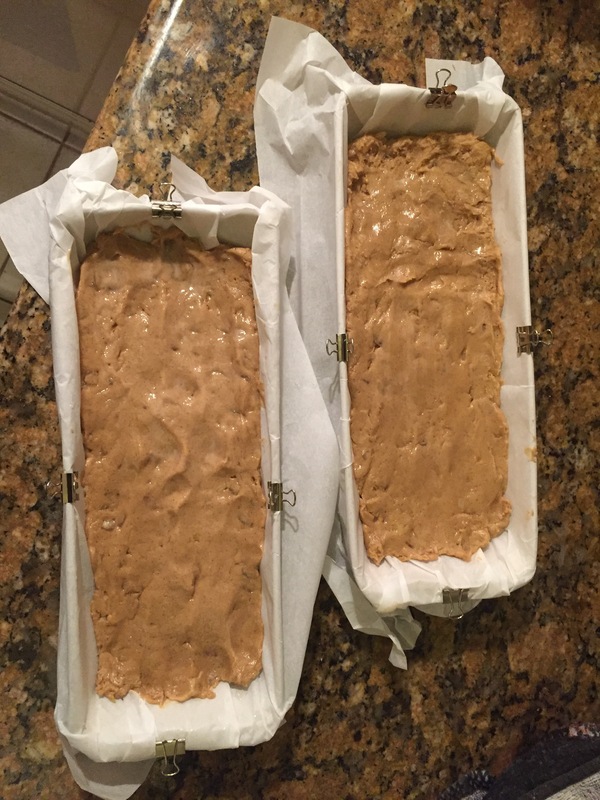 Biscotti can be stored at room temperature for one week; for longer storage, wrap airtight and freeze. Make sure they are well cooled. 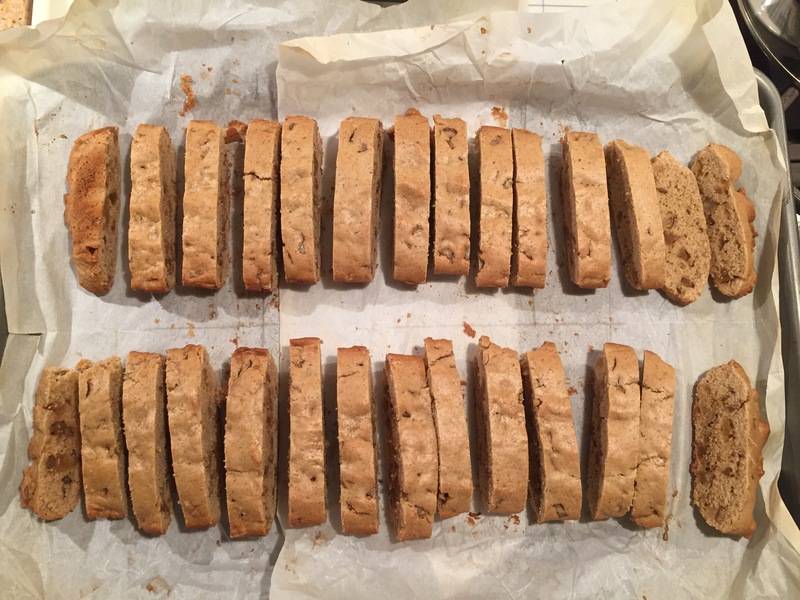 Yield: about 16 large (about 5 ½” long) biscotti.Variation: For smaller biscotti, shape the dough into two 12″ logs, about 2″ wide. Bake as directed above. Yield: about 3 dozen mini-biscotti. Posted in On Eating Around, Recipe? What Recipe?. Tagged Biscotti, Biscottie, Recipe. 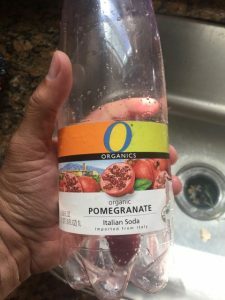 I tried this for Pauls office picnic and have done it several times since with both a vegan version and a regular one. 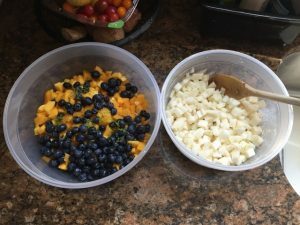 Several versions exist online but I found them too plain for me – so I adapted it some with adding the blueberries and more citrus. The big part of this is not to add herbs like basil unless you want it to become more of a “salsa”. Peel the jícama, and cut into 1/4″ dice (should yield 1-1/2 cups). Put over medium burner and cook for 3 minutes until the sugar dissolves; stirring constantly. Remove pan from burner, stir in jícama to coat, and allow the syrup to cool for 20 minutes. Meanwhile, peel the mangos, removing pit, and cut into 1/2″ dice (should yield about 4 cups). Add to a large serving bowl. Peel your oranges and cut away the pith. Slice into 1/2″ thick rounds and then into 1/2″ dice. 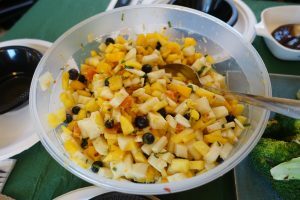 Add to bowl with diced mango. Add the rest of the lime and orange zest, honey and toss. After the syrup has cooled for 20 minutes, pour over fruit in serving bowl and toss until well combined. 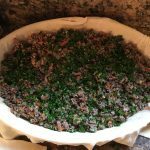 Cover and refrigerate for 15 minutes prior to serving. I think this is better after it has sit for a few hours or overnight. Add the chopped mint before serving. Posted in On Eating Around, Recipe? What Recipe?. 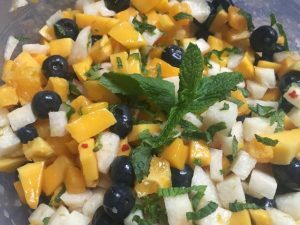 Tagged Jicama, Mango, Recipe, Salad. 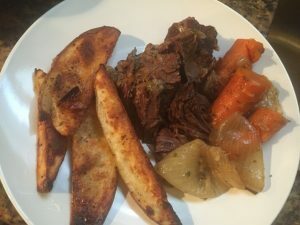 For part two of Pauls dinner, I decided to try Ree Drummond’s version of pot roast. 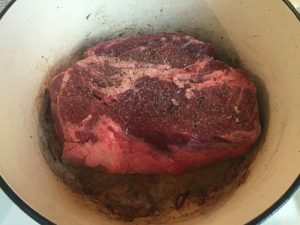 When I have made them before – I tend to use the crockpot – but the need to use an extra pan to crust the meat seems counter intuitive when I know I am going to be home and have a dutch oven to cook it in. Over all I think her recipe came to well – but I will notate placed I would change for the future (and one significant change I did make). 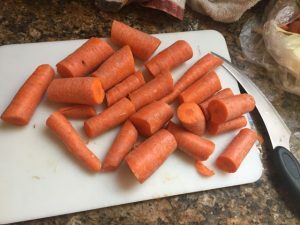 Throw the carrots into the same very hot pot and toss them a round a bit until slightly browned, about a minute or so. 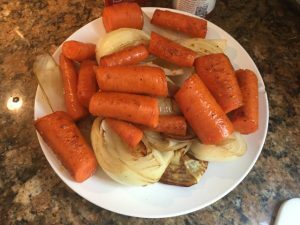 Reserve the carrots with the onions. 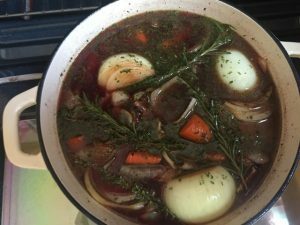 With the burner still on high, use either red wine [Remember I used Pomegranate soda] or beef broth (about 1 cup) to deglaze the pot, scraping the bottom with a whisk. Place the roast back into the pot and add enough beef stock to cover the meat halfway. Put the lid on, then roast for 3 hours for a 3-pound roast. 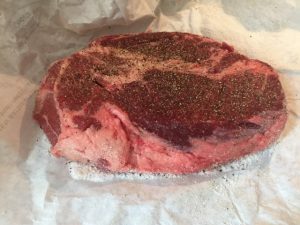 For a 4 to 5-pound roast, plan on 4 hours. The roast is ready when it’s fall-apart tender. [Mine was ready at the 4 hour mark!] Fall apart goodness. Note: During the last 40 minutes, I cut some wedges of potatoes and tossed with olive oil, salt, pepper and cayenne and tossed them in the oven to cook as well. 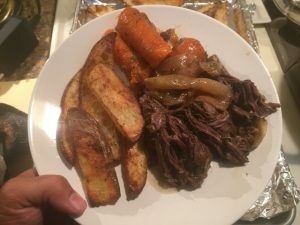 I wanted the crisp texture to contrast with the soft and chewy one of the pot roast. 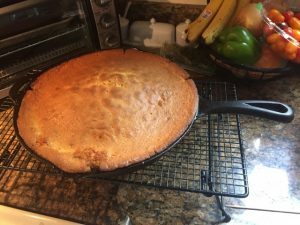 Posted in Recipe? What Recipe?. Tagged Recipe, recipes. After several weeks of vacation and a lot of work travel I haven’t been able to cook as much as I tend too. So when Paul got word about his promotion, it was a good reason to try out a few new recipes I have been waiting on. 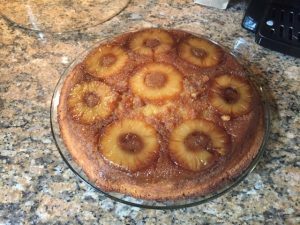 First off was the Pineapple Upside-down cake; for some reason I had a craving for its sweet and gooey texture when I got back from Provincetown. I cheated some and used a Duncan Hines box as the starter (and they were recently on sale) along with canned Pineapple. The recipe I started with is below and my changes are in red. Remove from heat. Evenly sprinkle with brown sugar. Arrange pineapple slices on top of mixture and place cherries in center of each pineapple; set aside. Combine cake mix, eggs, water, oil, salt, vanilla and instant pudding in large bowl. Pour batter evenly over fruit in skillet. Cool cake completely on wire rack in the pan. While it cools the dome in the middle will sink down and flatten out. Now to kick this up a few notches – you could drizzle in rum over the cake while it is still warm.. I am just saying..
Posted in On Eating Around, Recipe? What Recipe?. Tagged Recipe, recipes. 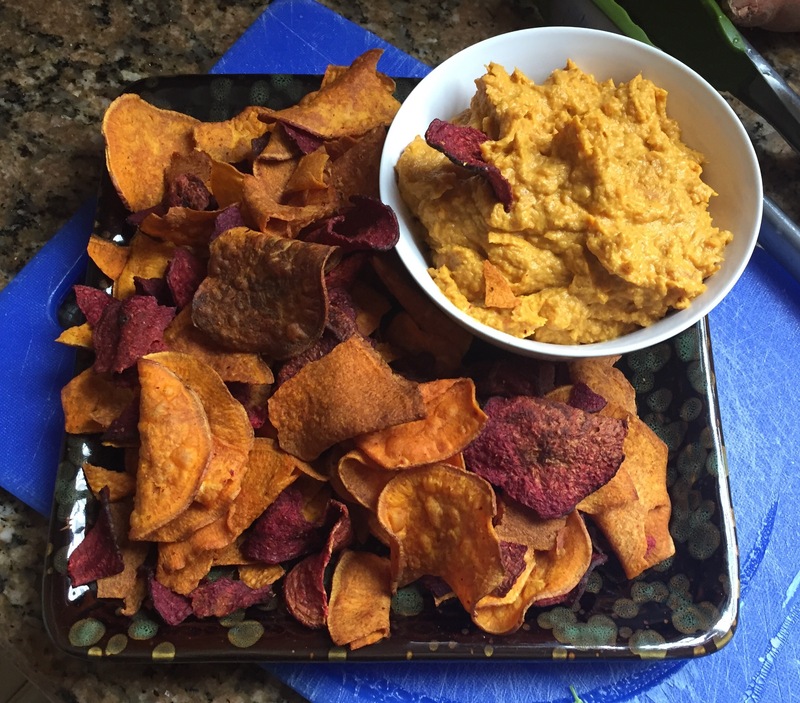 Tired of Regular Hummus? Try a Roasted Carrot Version! 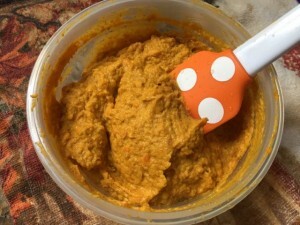 Yes – really.. carrots.. ok so it’s not really “hummus” (unless you actually add the Garbanzo beans) but the creamy, grainy texture that the roasted carrots and sesame paste creates with this recipe gives you great mouth feel and flavor. I found the recipe initially on the Joanne Weir website for CreateTV and adapted it some for my taste (and the fact I had forgotten that I ran out of cumin). 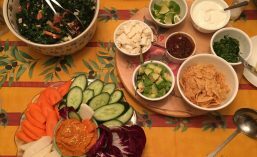 This version makes about 1 -1/4 cups of dip – but its pretty forgiving and I say double there recipe, it’s that good. Heat up the oven to 375°F. 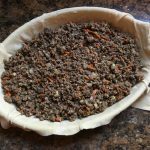 Place the carrots, salt, and olive oil on a large piece of foil or parchment paper. Toss together. Wrap them up and seal the edges so the steam doesn’t escape. Bake in the oven until tender, 30 to 40 minutes. Open the paper and continue to roast for 5 minutes. 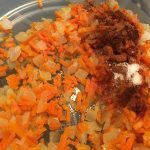 Pour the entire packet of carrots and oil into to the food processor with the remaining ingredients (except for the water and lemon juice). Process until smooth, scraping down the sides of the bowl. Add water if needed to make a thick dip the consistency of hummus. Season with salt and lemon juice to taste. This is also when you can add more honey, spices etc. This will keep in the refrigerator for a few days but I take it out about 20 min before serving. Hint: Want to kick this up a notch – stop by the cheese store and ask for a parmesan rind, about 2 inch piece will do – toss it in the soup early on and let it slowly melt. If you try this – don’t salt until you taste – the cheese has a salty flavor – so you want to taste as you go. Remove whats left of the rind before serving. 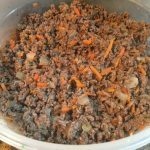 the cumin and fennel, add the ground chicken (The original recipe had you adding chicken first then adding seasonings but on the broadcast she did it this way and it makes for a better seasoned dish i think). Cook, stirring frequently, until the chicken is cooked through, about 8 minutes. Stir the flour into the chicken mixture. Add the beans, Swiss chard, corn, and chicken stock. Bring the mixture to a simmer, scraping up the brown bits that cling to the bottom of the pan with a wooden spoon. Simmer for 55-60 minutes until the liquid has reduced by about half and the chili has thickened. Add the red pepper flakes and simmer for another 10 minutes. Add pepper flakes earlier in dish if you want more heat. Season with salt and pepper, to taste. This weekend was definitely one of those – lets stay in and cook ones. Between the rain and the miserable drivers; it just was worth it to me to head out on Saturday night. 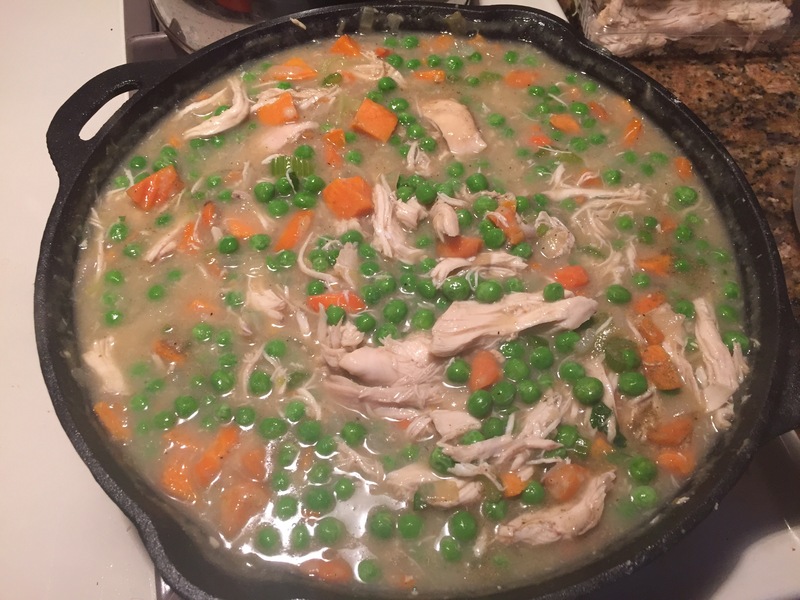 So while figuring out what to make, Paul suggested I do Chicken Pot Pie. Seemed like a good idea and one that would be able to handle a casual night at home. 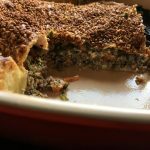 The is the adapted recipe I use. Note: For this version I worked with what was already “almost, almost” home made. 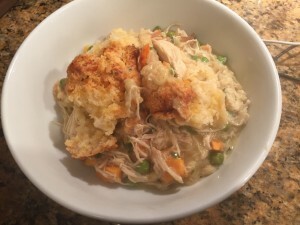 That meant I used a boxed biscuit mix (2 of them), Cooked and shredded chicken; our local grocery store roasts them and started selling the shredded meat. To make this even easier – use the pre-chopped veggies. 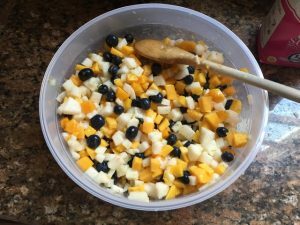 the other important thing to remember about this recipe is that the amounts are suggestion – customize it to what you have handy. 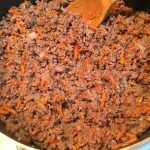 Toss in the oil, carrots and yams, stir to coat with oil for 2-3 minutes, then add celery, onions. Stir and cook another 3 minutes, add garlic, salt, pepper and 1 teaspoon of the poultry spice mix. Stir and continue to cook until veggies are cooked through but not browned. Add 1/2 cup of flour (or a gluten free alternative) on top of the veggies and stir, cooking for a few minutes more. Add 6 cups of chicken stock, holding back 1 cup for later if needed. Now – if by now you realize your skillet isn’t large enough (which happened to me), take out 1/2 of the mixture and add it to your casserole dish. 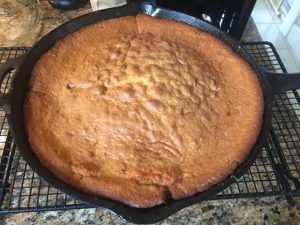 If you are using a 1/2 recipe you can actually back the whole dish in the skillet. Add the chicken, carefully stir the mixture slowly until it boils, them lower the heat and simmer 8-10 minutes. TASTE IT! Does it need more salt, pepper, etc. Add chopped parsley (or other fresh herbs to your taste), stir and pour into your casserole pan (or leave in the skillet if is over safe). Mix up a prepared biscuit mix as instructed. I used Red Lobster Cheddar Herb Biscuit mix but any will do or you can make your own. 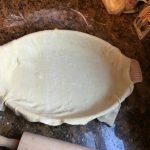 Spoon (or use your hands its a pretty sticky dough) to cover the “pie”. This creates the top “crust”. Try not to layer it on thicker than an inch or so – if you do – you may need to let it cook longer. to make sure the under side of the biscuits cook. 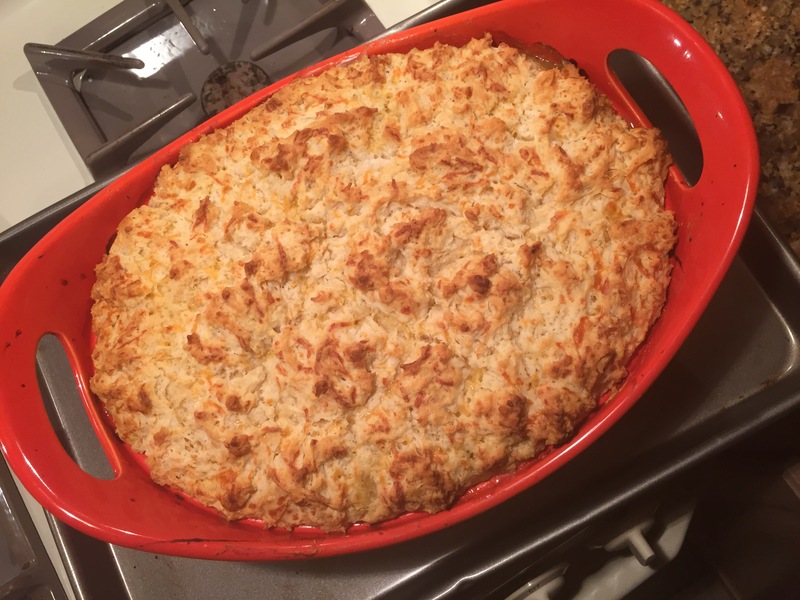 Place casserole on a cookie sheet, and place in the oven. 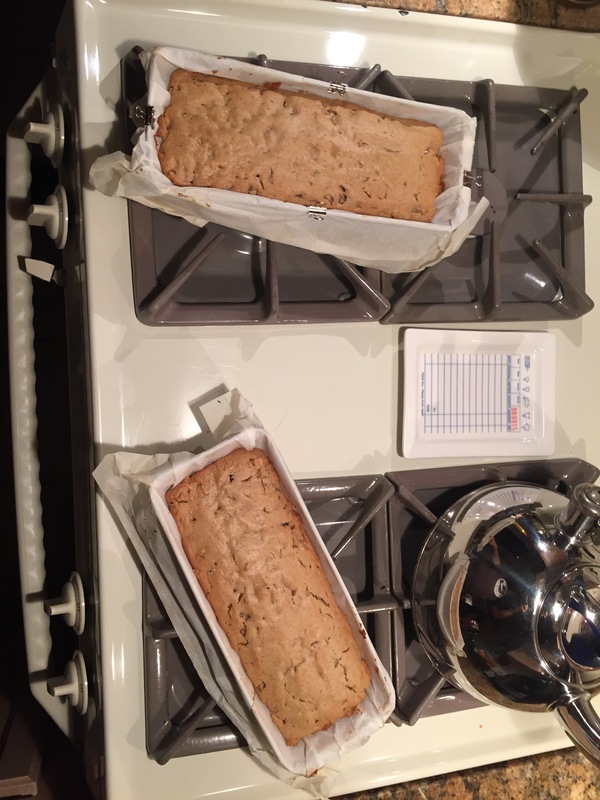 Bake at 425 degrees for 35 – 45 minutes. Around 30 minutes check the biscuit topping; if the top is browning too much – loosly place foil over the top for the rest of the cooking time. While baking- melt butter and mix with herbs ( I used 1/2 packet of the herb packet from the biscuits – but any will do). When you remove from the oven, brush the melted herb butter over the top of the biscuit topping.